We never shop much, but did pop some cheeky tourist shops where we purchased a few mementos that we could remember our 60 hours in Russia by. Tim’s staple souvenir is a flag, which he displays in his band room in our basement. When he asked a woman where he might find a Russian one in her store, she apologized and said they were out (who knew there were so many patriotic Russians?). “But, we do have flag of USSR if you want,” she said in a last-ditch effort. We aren’t allowed to stop at many stores, so for the rest of us interested in a souvenir, we better keep it a) fast and b) somewhere nearby. My dad’s wallet is a ticking timebomb. Shop too long and expect an implosion. We scurried to find whatever we could. Kevin went with a retro-Yuri Gargarin cosmonaut T-shirt. In keeping with our childhood days, my Dad remains heavily involved in selecting a doll wearing traditional garb for Morgan and me. Upon selecting two small figurines, my dad insisted that we go up a size and get the 12-inch dolls. It is the only instance in which Dad will ever suggest getting a bigger more expensive version of anything. For those of you (most of you) who have no clue who this is, it’s Stephen Garcia, the then-starting quarterback for Morgan’s school, University of South Carolina. After a series of suspensions and showing up drunk to a life skills class (ironic?) in Columbia, he later went undrafted in the NFL, took his talents north of the border, was suspended multiple times over and then was cut by the Montreal Alouettes. 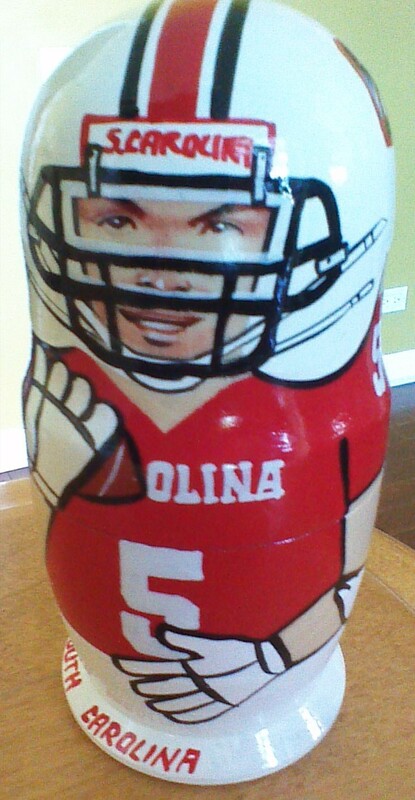 That sad excuse for a football player should be happy his face is on a hand-painted Russian nesting doll. This is as good as his legacy is getting (Don’t believe me? Take a look at what he’s doing now). I feel a need to contact him, as I am sure such news would brighten his day. First overall draft pick Jadeveon Clowney is nowhere to be found. Poor timing, this trip occurred weeks before his breakout hit at the Outback Bowl. 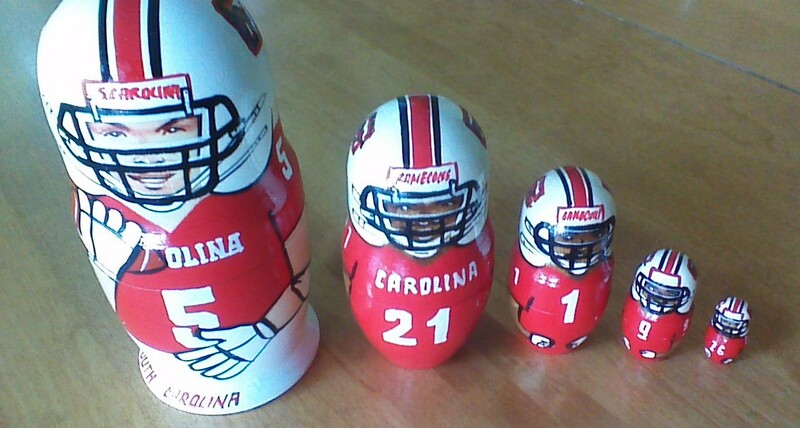 Russian souvenir shops seem so locked in to the college football world that I am confident they’ve updated the doll since then. While normally Dad would lament such a product as an overpriced tourist trap and is a relatively new South Carolina fan, he loves it as much as the diehards who have passed down season tickets like heirlooms. With shopping complete, and my dad and Morgan still giddy with excitement over their purchase, we asked people in the shops for dinner recommendations. Most everyone told us to go to a fast-food place called Mu Mu (pronounced moo-moo, its mascot is a cow) for dinner. Fast food? Really? That’s your favorite place? If this is what the people recommend, then so be it. My mom and dad vetoed Mu Mu on the grounds of a lack of nutrition and authentic cultural flair, respectively. I felt bad about not going, especially after repeated recommendations for something pegged as Russia’s fast food heaven. Mom had yet to eat borsch, a beetroot soup which is actually Ukrainian (err, Russia now?) that she wanted to try. So after much debate and hapless walking in the frigid Moscow air, we got so cold that we decided to walk in the next place that looked like they would serve borsch. It was a whatever last night in Moscow, nothing spectacular. We took the train back to the hotel, packed our things and crashed. We were headed to Istanbul the next day (or that evening, depending on what time of the day you consider 3 a.m.), stopping there for 8 hours en route to Prague. In retrospect, the fact that our planned 8-hour layover went wrong shouldn’t have been such a surprise. This trip had a foundation of a snap wedding in Vegas. There is nothing about a trip from Moscow to Prague with eight hours in Istanbul that should work out. I am fairly certain Turkish Airlines created this absurd route just to bait my father. There is no way anyone else would pay for this flight unless it was 60% off (it was not). Nevertheless, my dad and I had our entire day in Istanbul planned out. In fact, we planned more for our eight hours in Turkey than we did for the rest of the trip. I’d found a personal tour guide online who would pick us up from the airport and take us around all day, hitting all the top cultural sites and stopping for lunch and Turkish coffee all in six hours. We would be back at the airport to make our connection in no time. It sounded too good to be true. It was. Our 3:15 a.m. wake up call wasn’t bad. 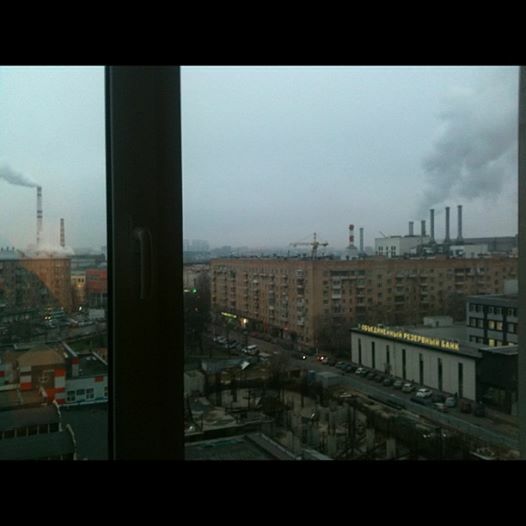 We’d been in Moscow for such a short time that no one had adjusted to the 9-ish hour time difference. We silently trudged to the lobby, where a young hostess called us two cabs which we piled our stuff into and drove off onto a dark, empty highway. There was nothing to look at out the window so I closed my eyes. It was cold. I regretted my role in planning this layover to Turkey. I was too tired to be excited about doing anything, and was actually relieved that I was skipping Prague with the rest of them and heading back to the U.S. to work. We arrived at Vnukovo International Airport not on time. We were amazingly, though only slightly, early. Customs were a breeze and we made it to our gate without issue. Next to it was a breakfast stand that was miraculously open at 4:45 a.m. It was unusually pleasant—no one was cranky and we were joking around. We split some pastries and got some sparkling fruity drinks Though they had only a slight alcohol content, we started drinking way too early. As we passed the time joking about how glad we were to be leaving Moscow, my mom noticed it was 6:15 and we hadn’t boarded our 6:30 flight yet. No one had made any announcements, and there was a host of other people at our gate, so we figured we were fine. And we were, until suddenly someone made an announcement in Russian on the loudspeaker. We waited for an English announcement that never came. Then suddenly, everyone got up and left the gate and ventured in another direction. There was no attendant to explain. We assumed there was a gate change, so finished up our last bites of the pastries and threw away the wrappers. We figured we’d simply check the departures board and see a new gate posted. 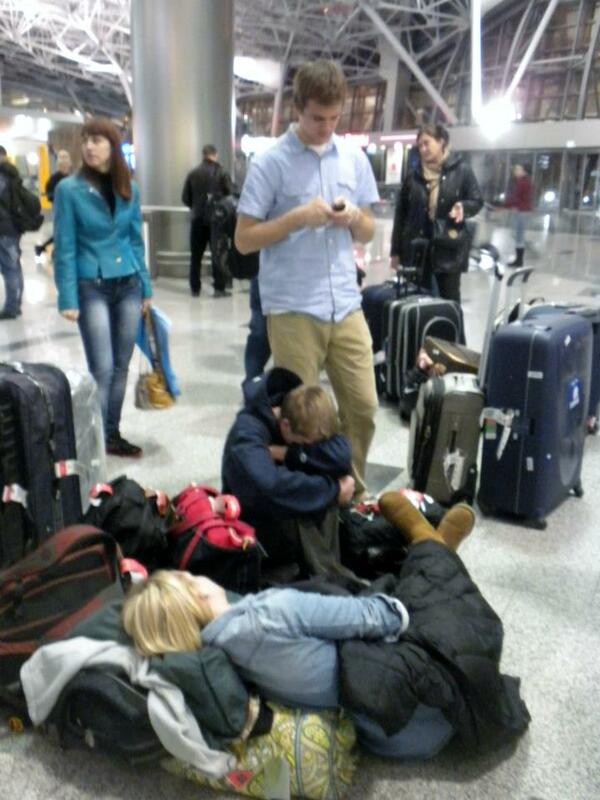 In that short time of cleaning up and gathering our carry ons, we’d lost every trace of our fellow passengers. The departures board still said our original gate. How do you say Istanbul in Russian? It didn’t matter. None of the other gates we walked past were lit up. It was as if our entire flight had disappeared into thin air. If our plane was still taking off at 6:30 a.m., it was leaving in 15 minutes. We had five minutes to find our plane before the gate closed. We were toast. I was freaking out. Morgan and I ran (really, really ran) ahead to see if any other gate had passengers. Then I heard the clicking of heels echoing through the empty airport. An agent was making her way toward us. Morgan and I stopped her. I tried showing her my ticket, but she just shook her head, barely slowing down to look at us. My dad went back to the gate to see if anyone had perhaps appeared to assist or direct passengers. No dice. Mom, Tim and Kevin power-walked through the terminal, past a series of closed shops and empty gates and finally caught up to Morgan and me. I saw another confused looking man. “Istanbul?” I asked with as confused look on my face as possible. He nodded, and pointed at security. “I think we go back out,” he said in broken English. I watched him go the wrong direction through security disappear back into the check-in area. That didn’t make any sense to me, but no one seemed to stop him. I hoped he was right, because I was about to drag my family to do the same, past the point of no return. Now all I had to do was get my dad, who was still poking around the original gate looking for clues. Off in the distance of the terminal I see him appear, carry-on bag in hand, walking. “What the hell is he walking for?” I complained to Morgan. “Has he no sense of time? Our plane is taking off in minutes.” I waved him on and signaled for him to start running by doing a jog-in-place jazzercise routine to signify urgency. He picks up the pace, albeit barely. I told him what the other man had done. Not seeing any other options, we decided to give it a try. Here’s hoping we were right. At this point, if our flight was taking off anywhere in this godforsaken airport, we’d missed it anyway. We went back through the metal director, which was being mildly attended by some chatty Russian authorities. I showed one of them my boarding pass, hoping for some sort of verification that we were not about to get arrested for what seemed to be an obvious security breach. She barely halted her conversation with another guy and seemed ok with us going back through. As we emerged on the other side, we saw the familiar faces of Flight 420 all in an orderly line at the Turkish Airlines counter. Without any idea of what we were in line for or why, we followed and made our way to the end of it. About 75 people were in front of us. We must have made our confusion overtly audible, because a man in front of us turned around and looped us in. “How long?” The man didn’t know, but said he’d loop us in if any more Russian announcements were made. The line that showed no signs of moving, so Kevin, Morgan, Tim and I decided to pile our carry-ons into a series of pillows and made ourselves comfortable on the dirty tile floor. My mom was too tired and pissed off to yell at us. My dad is pissed, not at us, but the situation, and walks out of line. Our dream day in Istanbul was slipping away by the minute. While this situation looks less than thrilling, what followed broke records for the longest I’ve stayed awake, the longest I’ve sat at an airport and is now remembered as one of the most inconvenient, unlikely and most unforgettable days of my life. Great one Amanda! Can’t wait to hear what happens next!